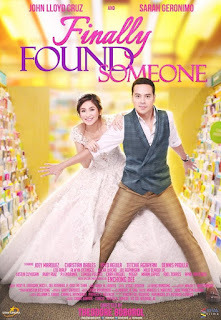 Finally Found Someone, a romantic comedy film starring Sarah Geronimo and John Lloyd Cruz. The film is directed by Theodore Boborol and under the production of Star Cinema and Viva Films. The film was released in cinemas nationwide last July 26, 2017. The story started when Aprilyn (Sarah Geronimo), who was left in the altar by his groom on the day of their wedding becomes viral online. Seeing by millions and one of them is the father of the groom. Feeling guilty of what happened, he hired Raffy (John Lloyd Cruz) who works at a PR agency to help Aprilyn move on. While in the state of devastation, Aprilyn met Raffy, he explained his role in her process of healing and since then the two were side by side every day. As the days goes by Aprilyn is back from her feet with the help of Raffy of course. And they realized that both of them are in love with each other. Another box office hit by the unfading tandem of Sarah and John Lloyd after 3 successful movies before. They never disappoint us by their chemistry and kilig moments in the movie, Finally Found Someone. I must say, a blockbuster hit and will be enjoyed by all the avid fans of the two main characters. Worth it to watch.